The confidence in the Modern and Contemporary Photography market increased by 38% from October 2011, and currently stands at 63. This is above the 50 level, which indicates that there is more positive market sentiment than negative. Both the Modern and Contemporary photography markets have seen a significant lift in confidence. 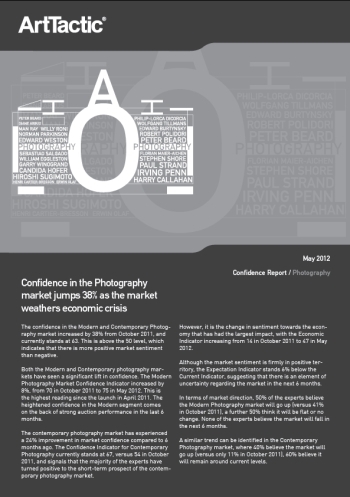 The Modern Photography Market Confidence Indicator increased by 8%, from 70 in October 2011 to 75 in May 2012. This is the highest reading since the launch in April 2011. The heightened confidence in the Modern segment comes on the back of strong auction performance in the last 6 months. The contemporary photography market has experienced a 24% improvement in market confidence compared to 6 months ago. The Confidence Indicator for Contemporary Photography currently stands at 67, versus 54 in October 2011, and signals that the majority of the experts have turned positive to the short-term prospect of the contemporary photography market.